I interview my father's mother at the 24th of december, in the simple kitchen with the wood-fired oven where I spent many hours of my childhood. In that room full of memories and a present encounter I realize, that my and my grandma's world are shaped differently, although they are sharing the same space. That some things may have a completely different meaning due to the times we lived. When I tell her that I'd like to take a picture of her, she explains that in former times, girls at the age of eighteen would go to the photographer for a picture. In a borrowed dress, mostly. So you know, Leonie, I think, how grandpa and I are living; this is actually the best time and I wish for everyone that one can enjoy this. My mother for instance was only fifteen and her father was in war and they had basically nothing. And my grandfather died with 52, since then my grandmother was on her own. And now as the saying goes: I want to go to bed with you in the evening and wake up with you in the morning, and every morning, I poke grandpa to wake up. Here is home for me. Although, in the beginning, Benno (grandpa) always told me when I came from Maberzell: Your home is here now. But you know, I grew up there and went there for fifty years, twice a week. And it did hurt, when the old house was torn down. I couldn't look at the place for a while. Although I don't live there anymore since fifty years, I still went there because of my brothers, and I always stayed in my role of the big sister. How I met your grandfather. And then the first child... when Klaus was born. But the others, too. With Joachim, I use to think... (My daughter) Elke died right after the birth and I always thought: I have to have another child to come over it, because it was so horrible for me. And I always think: Joachim is one, who never nettled me consciously. Until today. Like this noon, he called me, although I know that he doesn't have much time. A good boy. All the three of them. Julian's question: Describe the feeling of loving somebody deeply. My grandpa steps in. I tell him about the questions, he answers. It is... well... nice, how should I say, when you know, where you belong, Leonie, and that you are loving that person. Long silence. We change the subject. My grandmother continues. If I hadn't had my faith... it helped me so much, when things were bad, so that I could go through it. And somehow it helps me... as I don't have to be afraid of death. We come to speak about refugees. My grandma gets in a rage. I absolutely don't understand how people can complain about them! Of course there are wrong ones among them, but among the germans as well! And imagine where they had to go thorugh to come here... I don't understand why people are complaining so much, why they are so dissatisfied although it is said: Love your neighbour as yourself. 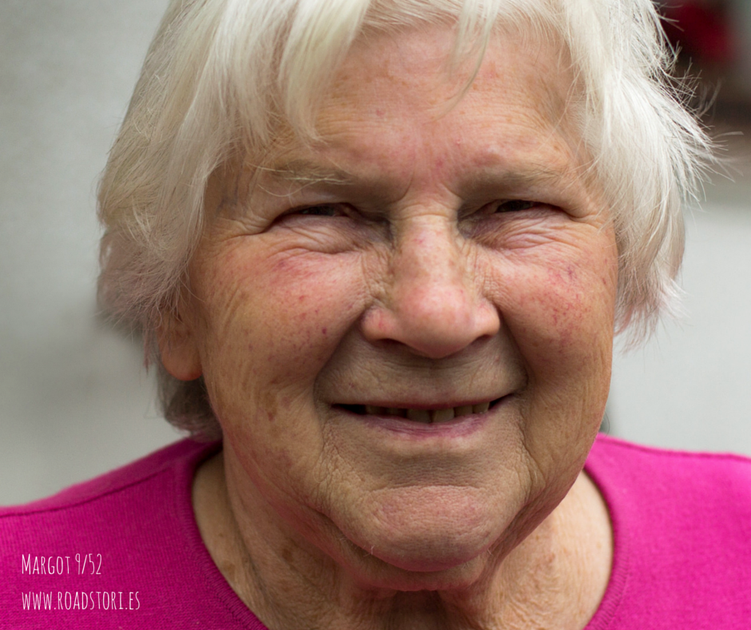 Margot's question to you: Why are people so discontent and what is so hard about loving your neighbour as yourself?